Producer Marsha Roberts shortly before the doors open at the Andrews AFB theater just outside Washington, DC. Marsha spent years learning how to entertain an audience, first as an award winning film editor and eventually as a producer. The more she became involved in show business, the greater the pull toward theater. 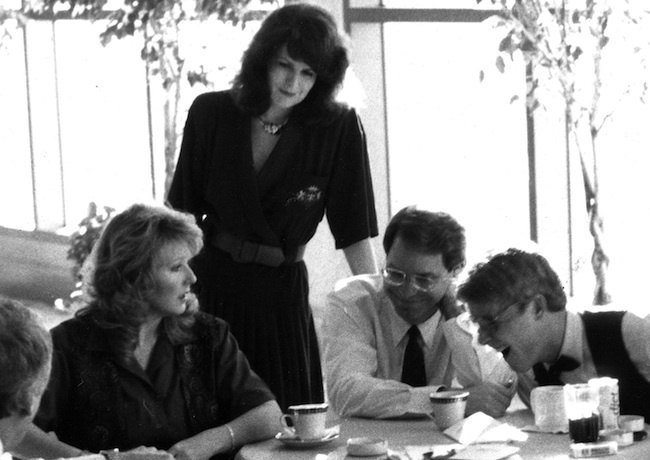 She formed Produced By Marsha Roberts and created unique “Corporate Theatre” presentations both in the U.S. and abroad for companies such as Coca-Cola, IBM, and Domino’s Pizza. Marsha Roberts (standing) during rehearsals for Georgia Pacific corp. theater show. The other lady is Della Cole, the actor who would soon become the original Katharine Hartgrove in Letters From the Front. These productions whetted her appetite for the real thing, which came in the middle of the night on September 13, 1990 when she awoke with a clear vision for Letters from the Front. Luckily her husband and business partner Robert Rector was a writer. 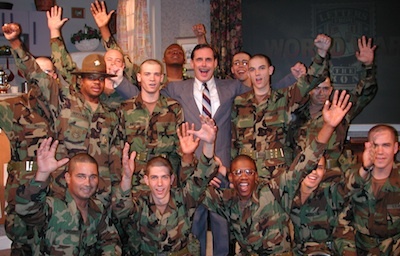 Six months later, on March 6, 1991, Letters from the Front opened at the 14th Street Playhouse in Atlanta. 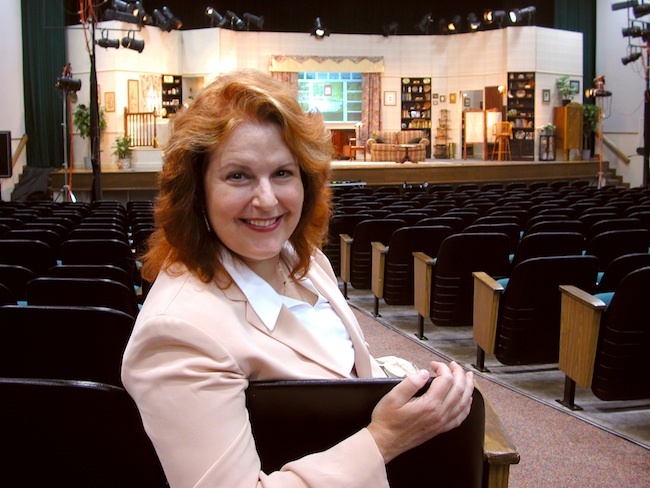 Since then, through her skill, determination and considerable powers of persuasion, Marsha has taken the production to hundreds of venues across the world. Standing-Os are common for our show, and always appreciated. 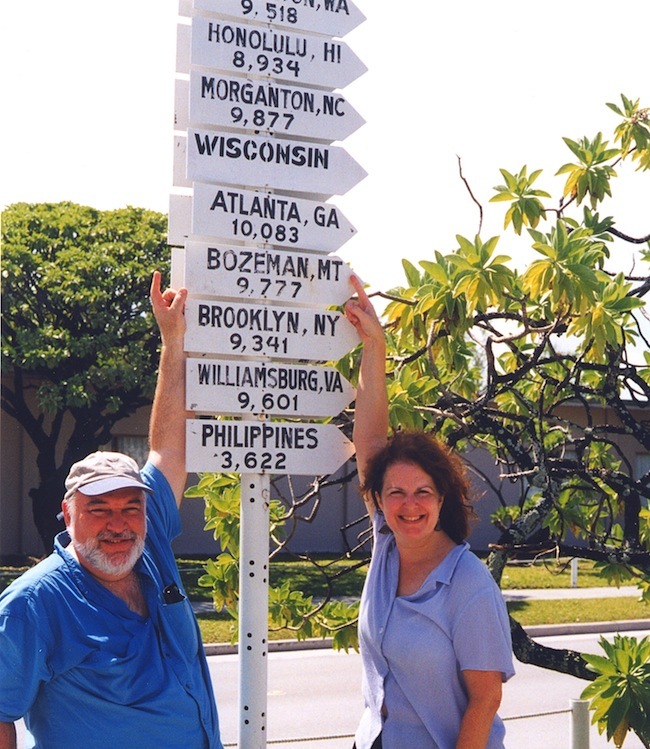 Playwright/Director Robert Rector and Producer Marsha Roberts while performing Letters From the Front in Diego Garcia in the Indian Ocean. It’s a long way from home – any home! Marsha is also a published writer. Her book Confessions of a Mutinous Baby Boomer receives 5-star reviews and is available in paperback and e-books through Amazon, Barnes & Noble, Ibooks, and other outlets. It’s also available as an audiobook. Robert Rector behind the camera at Camp Pendleton, CA. Robert came to theatre after years in film production as a writer, director, cinematographer, editor and animator. He was one of the pioneers of music videos, making films for Bob Whitney’s groundbreaking TV show The Now Explosion — continuous top-40 TV programming ten years before MTV. 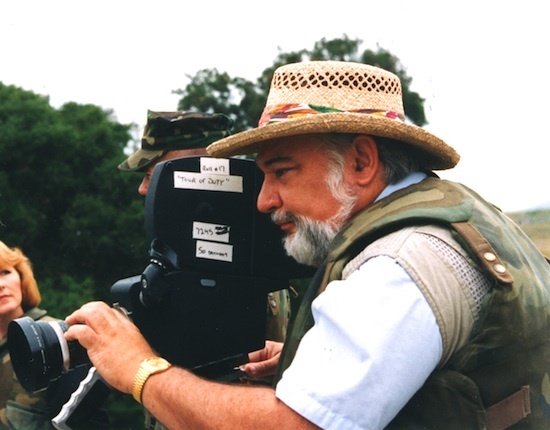 He has won national and international awards for his documentaries, TV shows, corporate films and corporate theater. He also wrote and directed an outdoor-adventure feature, Don’t Change My World, which played in theaters, HBO, CineMax, BBC, and on home video. 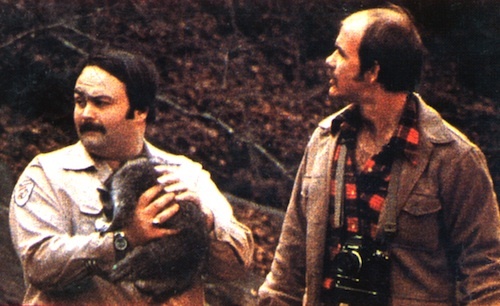 The script at the beginning of production. It doesn’t look this nice by the end of a tour. Recently Bob has turned his talents to novel writing. His romantic thriller Unthinkable Consequences, set in S. Florida in 1959, is available in both print and ebook through most online book sellers. 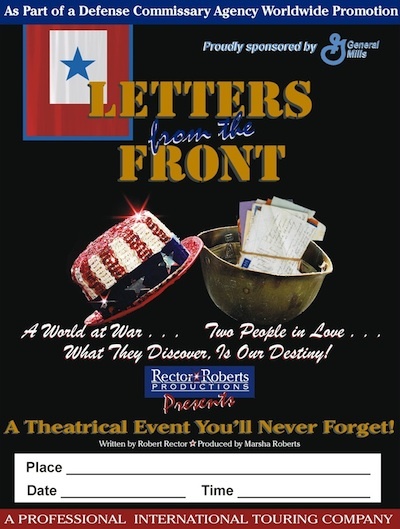 Since Letters From the Front first premiered at Atlanta’s 14th Street Playhouse on March 6, 1991, 14 actors have played the lead roles of Katharine Hartgrove and Johnny Chastain. The six listed below racked up the most stage time both at home and abroad and were enormously popular with audiences. 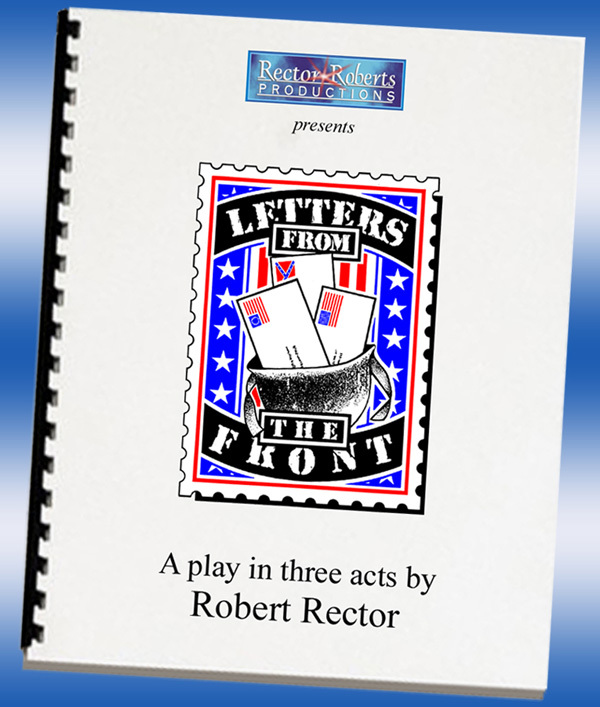 Della Cole originated, and more importantly, defined, the role of Katharine Hartgrove when Letters From the Front first opened in Atlanta in the spring of 1991. Since then she has endeared herself to military personnel all across America, Europe, and the Pacific Rim, celebrating her 150th performance on Veterans’ Day 1997 at Soldiers’ Theatre in Vicenza, Italy. Della starred in the play from 1991 through 1997, then returned to christen the WWII edition for the 1999 Pacific Rim Tour. 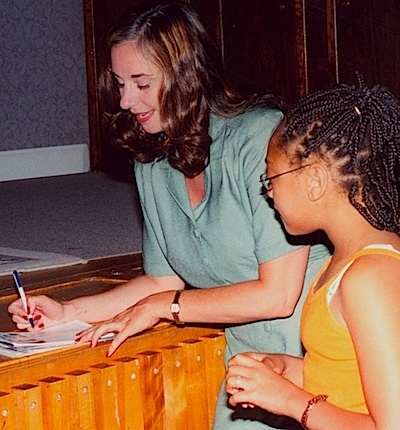 For the 2001 10th anniversary tour, Della served as director on the Spring leg, then pulled double duty as both star and director for the Fall leg. Those who have worked with Della know her to be a consummate professional dedicated to her craft. Off stage she is known for her cackling laughter, her wacky, sometimes bawdy, sense of humor, and her ready hugs. On stage she is sheer magic. Coming from a solid background of theatrical films, network TV shows, and years on the boards in a diversity of productions from Streetcar Named Desire to Pirates of Penzance, Della brings a level of skill to her acting that moves drill sergeants to tears. During her six tours of Letters from the Front Della played at more than 100 military installations around the world. Della also owns and operates the Southeast’s premiere acting school, YourAct, located in Atlanta. 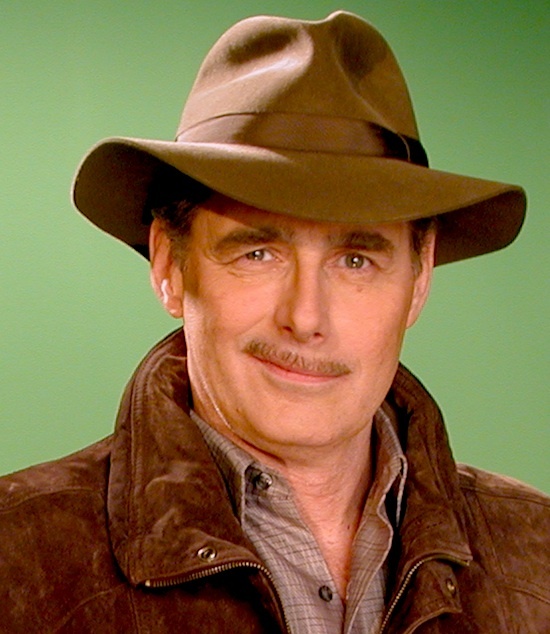 Neal Matthews charmed audiences with his exasperatingly lovable rendition of Johnny Chastain for longer than any other actor who has played the role — 121 shows — an impressive number considering that a touring play can only stage two or three shows a week. Neal’s portrayal of Johnny Chastain was in equal parts comic, soulfully chilling, and heartwarming. That he succeeded brilliantly in the role has been confirmed by the enthusiastic response of audiences both stateside and overseas. 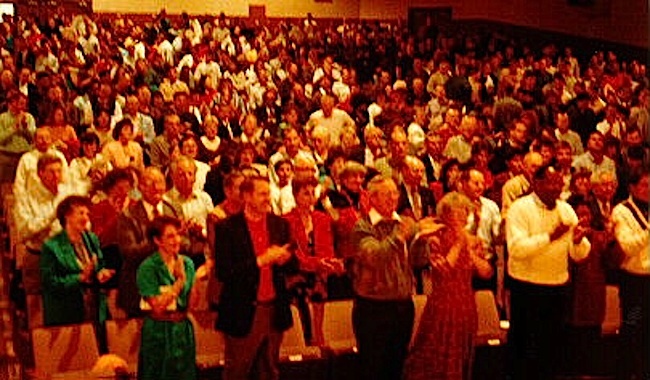 Standing ovations were common occurrences, often accompanied by cheers and requests for autographs. Touring the world allowed Neal to pursue his passion for mountain climbing — from Pike’s Peak in Colorado to Mt. Etna in Sicily. Being a true son of the Shamrock, Neal made a point of locating an Irish pub in each city he visited — whether in Chicago, Illinois or Rota, Spain — and sharing a brew (or two) with his kinsmen. Michelle Rosen played Katharine Hartgrove both stateside and overseas. Having starred as Christine in Phantom of the Opera in overseas (the Lloyd Webber version) and national productions (the Kopit/Yeston version), Michelle has now added the flinty but big hearted character of Katharine Hartgrove to her repertoire. During the Letters From the Front Mediterranean Tour and the following Stateside Tour, Michelle received heartfelt accolades from military personnel who had the pleasure of seeing her perform. “Michelle has an extraordinary way of making the audience feel the emotions she is trying to express,” wrote an audience member in Vicenza, Italy. Michelle is a seasoned road warrior who has starred in national tours of Carousel, The Mikado, and Pirates of Penzance. An accomplished vocalist, she has also appeared in numerous New York operas, as well as musical theatre productions in New York and throughout the country. She was even called on to sing the national anthem before a Mets game. It has been said that nobody can play a New Yorker like a New Yorker. The character of Johnny Chastain is a true New Yorker and so is Bob Curren, who has resided and worked in the Big Apple all his adult life. Bob brought a street-smart edge to Johnny along with the chutzpa you might expect from a former vaudevillian turned radio star. His Johnny had swagger and flair and a mouth loaded with wise cracks just waiting to be fired. Audiences loved him. 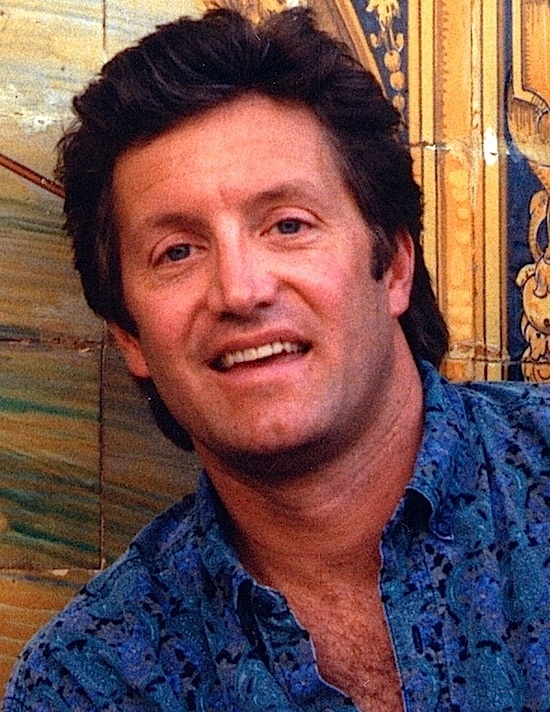 During his first stint as the jaunty wild man Johnny Chastain, Bob added even more personal stories to his repertoire, this time of a poignant nature due to the events of Sept. 11, 2001. He was in the middle of rehearsals when news of the terrorist attack shook the nation. A couple of weeks later he was on stage at Ft. Campbell, KY as the 101st Airborne’s “Screaming Eagles” were preparing for deployment to Afghanistan. The night before the war’s first bombing mission was launched from Whiteman AFB, Bob was there entertaining families and comrades of the flight crews. The meet-and-greet with audience members after each performance, a tradition with Letters From the Front since its beginning, was Bob’s favorite part of each show. When originally asked why she wanted to play the role of Katharine Hartgrove in Letters From the Front, Bobbi Kravis responded, “I want to be challenged,” noting that there are very few roles today for women that are as meaty and meaningful as that of Katharine Hartgrove. 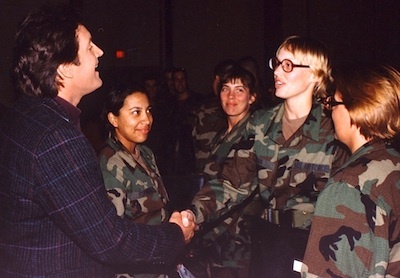 She had also researched the show extensively and was impressed with accounts of the play’s “mission of service to those who serve us.” “I like helping out,” she says, referring specifically to the Worldwide Letter Writing Campaign spawned by the play. Bobbi Kravis’s entrance into theatre was a bit unorthodox. She was originally a sixth grade Language Arts teacher. “Keeping the attention of 11 year olds is the best stage training I’ve ever had!” she says. Finding herself with some free time on her hands over a summer break, she took the suggestion of a friend who was a member of a local community theatre group in desperate need of “warm bodies” for the chorus of its upcoming production of South Pacific and found herself bitten by the acting bug. A few productions later she was discovered by a local agent, which led to commercial, print and industrial film work in the Cincinnati, OH area before moving to New York City. 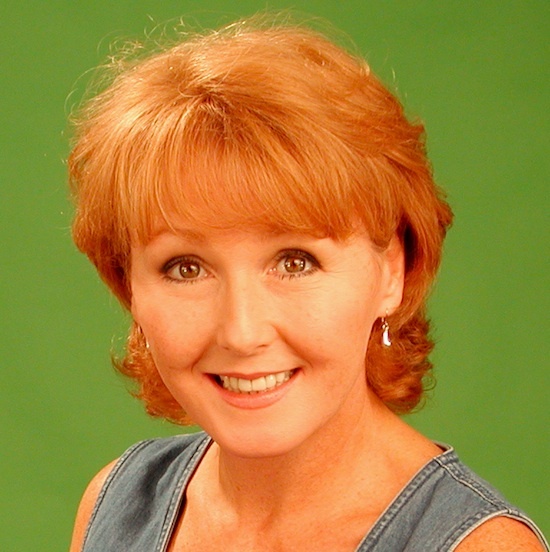 No stranger to touring, Bobbi appeared as Ethel McCormick in the 2001 national tour of Footloose. 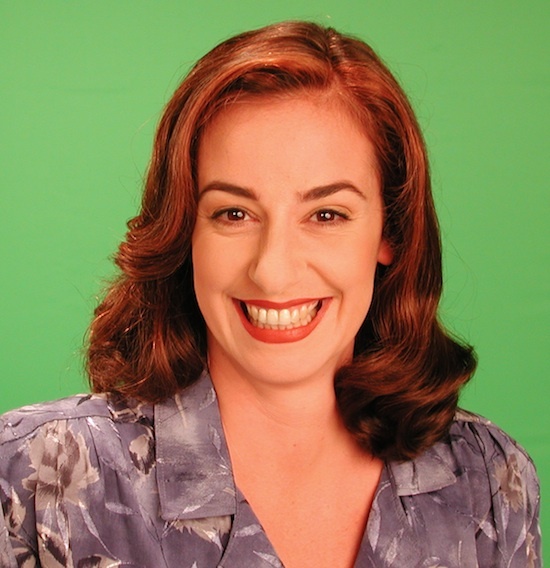 A comedienne as well, Bobbi writes and produces her own one-woman shows when back home in New York. She weaves song through an array of outrageous characters in productions with titles such as Who Invited the Elephants?! and Midnight At The Rollerdrome.